The 8800A series are general purpose combustible gas detectors which may be used in almost any situation where a combustible gas, vapor or residueneeds to be found. The unit should always be switched on and calibrated in non-contaminated atmosphere in order to insure correct operation and indication. Approach suspecteted hazardous areas with the unit on. Always check the instrument on a know combustible leak source before using. Before detect the gas, please kindly adjust the key "sensitivity" to louder situation. 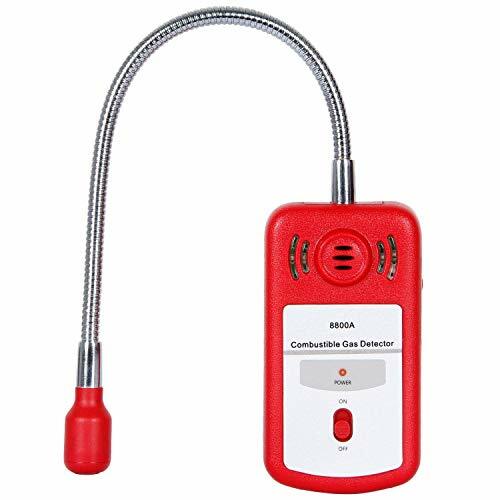 Adjustable sensitivity: Tektree combustible gas detector has audible and visual alarms with adjustable levels to be responsive and accurate to leaks. User-Friendly: Easy to calibrate,the visual and aural alerts are easy to understand and the leak can be easily fixed with a new elbow. Time, money and life saver: Tektree gas sniffer reduces your need to call out the FD or energy company on false odor smells which is cheaper than calling the plumber to make sure you don't have a leak and brings you peace in mind. Versatile: Tektree gas leak sensor is a great working gizmo as a good way to isolate or confirm a possible gas leak. It's a perfect basic device for a homeowner with gas appliances since it works with any gas or volatile liquid like gasoline and kerosene . 100% Sastisfation Guarantee: Tektree is dedicated to address any product/service issues and is committed to delivering a 5 star experience for all buyers by offering 12-month warranty and hassle-free return policy to ensure our customer satisfaction. If you have any questions about this product by Tektree, contact us by completing and submitting the form below. If you are looking for a specif part number, please include it with your message.